Few pieces of rock garner more respect from rock climbers in Rocky Mountain National Park than The Spearhead. Located nearly at the start of Glacier Gorge and nestled right on the backside of Longs Peak, The Spearhead is both imposing and beautiful. As rain showers moved out, the sun rose from behind Longs Peak and dappled The Spearhead in sunlight. 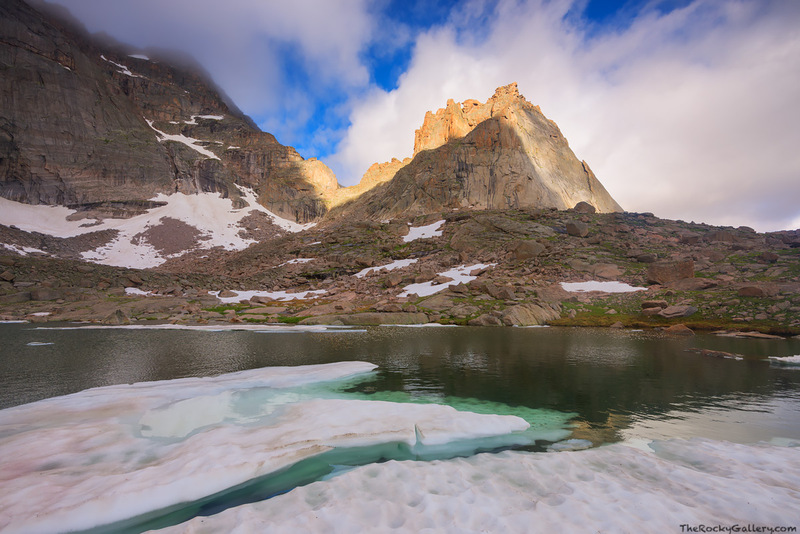 It's was the second week of July when I photographed The Spearhead from Green Lake, but Green Lake still had yet to shed all of it's icy layers from winter. Photo © copyright by Thomas Mangan.